226. This movement is designed to double the speed by gears of equal diameters and numbers of teeth—a result once generally supposed to be impossible. Six bevel-gears are employed. 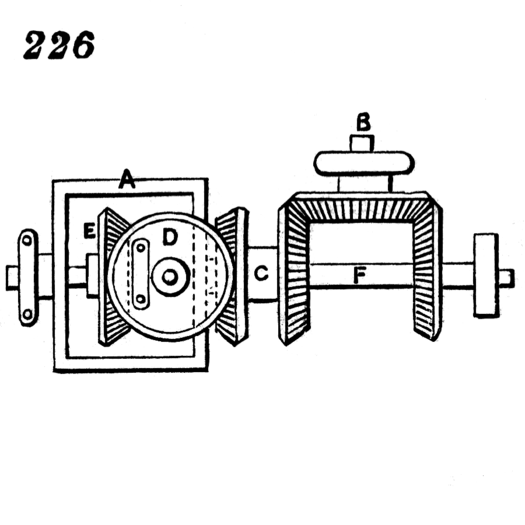 The gear on the shaft, B, is in gear with two others—one on the shaft, F, and the other on the same hollow shaft with C, which turns loosely on F. The gear, D, is carried by the frame, A, which, being fast on the shaft, F, is made to rotate, and therefore takes round D with it. E is loose on the shaft, F, and gears with D. Now, suppose the two gears on the hollow shaft, C, were removed and D prevented from turning on its axis; one revolution given to the gear on B would cause the frame, A, also to receive one revolution, and as this frame carries with it the gear, D, gearing with E, one revolution would be imparted to E; but if the gears on the hollow shaft, C, were replaced, D would receive also a revolution on its axis during the one revolution of B, and thus would produce two revolutions of E.